Chantry Flats Cabins – How Did They Get Here? An idyllic scene of cabins found along the trail in the Big Santa Anita Canyon. They are privately owned by individuals and families within the U.S. Forest Service Recreational Residence Program. The special-use permits for these cabins prohibits them being rented out. Please respect the privacy of cabin owners. When first hiking into the Big Santa Anita Canyon along most any of the trails, one can’t help wondering about the origins of the little Chantry Flats cabins that appear alongside the paths and streams. Construction of these early dwellings dates back to the early teens and 1920′s. Back then, during the Great Hiking Era, the U.S. Forest Service was actually encouraging the building of cabins on “never before settled” suitable locations in a number of national forests throughout the United States. In the Big Santa Anita Canyon, all kinds of potential cabin “sites” were discovered and developed. Typically an Angeles National Forest ranger would hike to the potential site with the cabin builder applicant for approval of a special use permit or not. Back then, the Chantry Road to the current trailhead did not exist. The road would not be built to Chantry Flat until 1935. Therefore, you would hike all the way from Sierra Madre, thus adding about 4 miles each way to your destination. It was over 8 miles one way to Sturtevant’s Camp, versus the current 4 mile trip in! There were motivated hikers, to say the least. When the cabin building program began, “recreational resident cabins” (U.S. Forest Service language) numbered over 220 + in the Big Santa Anita and Winter Creek canyons. Materials for these cabins was hauled in on mules and people’s backs for the numerous building projects. Pack trains travelled the narrow mountain trails seven days a week through the busy construction years. Not only cabins were being built, but trail resorts were springing up as well! Five resorts alone were in existence during this period. Hoegees, Roberts’ Camp, First Water, Fern Lodge and Sturtevant’s were enormously popular for groups of hikers seeking an overnight experience. Information about the colorful events from the camps is a separate subject entirely. Just imagine how the canyon would have sounded and looked during the evenings as lanterns flickered through the little windows amongst the trees and reflecting stream. As for the cabins, a number of natural and man-made events pared down the initial number of structures dramatically. A great flood that took place in 1938 (the 38′Flood) washed out many cabins, not only in the Big Santa Anita, but in other front country canyons such as the Arroyo Seco and San Gabriel Canyon as well. The next sizable event for the canyon was the 1953 Monrovia Peak Fire, which started up at Spring Camp near the summit of Monrovia Peak. More cabins succumbed to this catastrophic fire which burned for weeks. In 1969, yet another flood occurred, which took out some more of the cabins. Amongst all this, occasionally cabin owners have had a part in accidentally burning down their own dwellings. Although uncommon, it has happened even into recent times. Today, there are less than 79 cabins left standing in the Winter Creek and Big Santa Anita canyons. The cabins are privately owned and are a labor of love to say the least. To this day, supplies are hauled in by the Adams Pack Station at Chantry Flats. Items such as propane, lumber, groceries, furniture, roofing and more are taken to the trailside cabins by the pack string of mules and donkeys. Also, a frequent foot patrol takes place to ensure the security of the cabins. The cabins are unavailable for rent to the general public. If you’re interested in purchasing one, go to the Adams Pack Station website (www.adamspackstation.com) to inquire about cabins that may be up for sale. The cabins are located on public land, so cabin owners must comply with U.S. Forest Service regulations in regard to everything from paint color, type of roofing, sanitation practices and the gathering of downed wood. When you’re out hiking or backpacking, please respect the privacy of the cabins. 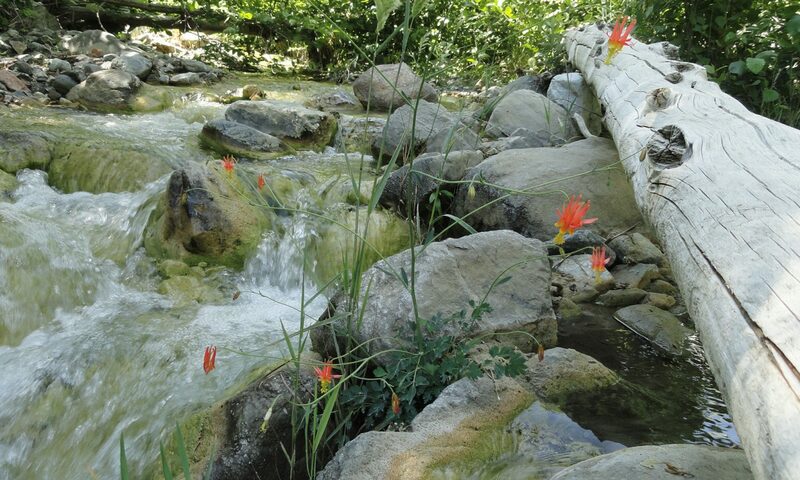 Many people have been drawn to the Big Santa Anita Canyon due to its’ popularity as one of most scenic L.A. County waterfall hikes. These unique little cabins are a sweetly unexpected find for the eyes. If you’re interested in ever spending the night in a cabin, there is one place where you can rent. Sturtevant Camp, located a couple of miles upstream from Sturtevant Falls, is available to individuals, couples and groups by reservation. The camp has comfortable, clean amenities and is open throughout the year. Check out the Adams Pack Station website adamspackstation.com for details on how to make this happen. Next PostNext Consider Bringing Just a Little Extra on Your Next Hike….